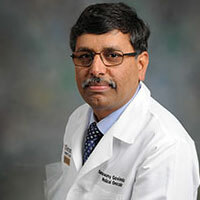 Dr. Ramaswamy Govindan is a medical oncologist handling cases of pleural mesothelioma and lung cancer at the Washington University School of Medicine and the Siteman Cancer Center in St. Louis. Govindan is known for his innovative research — particularly in genomics — that is being used to develop better lung cancer therapies and significantly improve patient outcomes. He is co-chair of the Cancer Genome Atlas project, a nationwide effort to personalize cancer care through identifying genetic mutations. Govindan also leads a multicenter clinical trial that assigns cancer treatment based on molecular alternations in the tumors of individual patients. The trial is known as ALCHEMIST (Adjuvant Lung Cancer Enrichment Marker Identification and Sequencing Trial). Washington University recently awarded Govindan its prestigious Anheuser-Busch Endowed Chair in Medical Oncology at Barnes-Jewish Hospital. Govindan is part of a multidisciplinary team at Siteman that specializes in lung cancer and pleural mesothelioma. He works closely with surgeons Dr. Alexander Patterson and Dr. Benjamin Kozower, who also specialize in lung diseases, along with a team that includes pulmonologists and radiologists. Siteman is the only cancer center in Missouri with the prestigious Comprehensive Cancer Center designation from the National Cancer Institute. It is an international leader in cancer research, prevention and treatment. Siteman provides for close to 10,000 cancer patients annually with a full range of diagnostic and treatment services. Govindan was the principal investigator for a phase II clinical trial — sponsored by the National Cancer Institute — studying mesothelioma and the drug Iressa (gefitnib). He is currently conducting several clinical trials involving lung cancer. He also is known for his patient-centric care in the clinic and his bedside manner. Govindan completed his fellowship in hematology and oncology at the Washington University School of Medicine. He earned his medical degree from the University of Madras in India. He did a residency in internal medicine at the Michael Reese Hospital in Chicago before joining the Washington University faculty in 1998. Disclaimer: Dr. Ramaswamy Govindan has no professional affiliation with Asbestos.com. Siteman Cancer Center. (n.d.). Ramaswamy Govindan, MD. Goodwin, J. (2014, September 22). Washington People: Ramaswamy Govindan.